Do You Dream to Publish a Book- But Lack the Time or Know-How? Look no further. This powerful learn-by-doing workbook grants you the time and know-how. Learn to publish a printed book in 3 days by actually doing it! Once you become a published author, your friends, family, and peers will see you in a whole new light! This unique new system familiarizes both aspiring and seasoned authors with every step of the self-publishing process. You won't even need your completed manuscript to get started. Complete this workbook, and your result will be a published proof of your book concept in hand. This powerful learning process prepares you to propel your book to final publication on Amazon.com. This system not only circumvents countless hours of learning time and frustration, but as a writer, you will be well positioned to publish again and again. 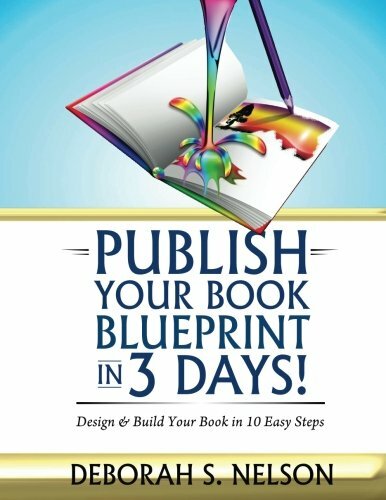 This Book Blueprint system: Includes a downloadable interior template Displays parts of a book in chronological order Gives 10 easy steps to print on demand publishing Sets you up for free ISBN number and self-publishing account Gets your book blueprint published in 3 days! (shipping time extra) Includes your ISBN number, interior template, and options to print a custom book cover and interior. There are no more excuses. Buy this workbook to learn how to publish the book you have always dreamed of; and become a published author now in 3 days.